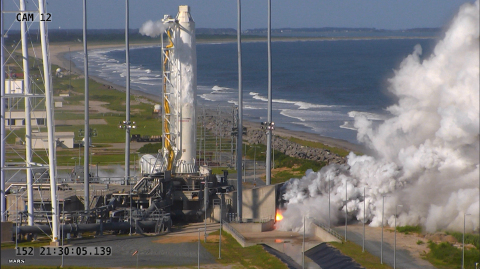 DULLES, Va.May 31, 2016-- Orbital ATK (NYSE: OA), a global leader in aerospace and defense technologies, today announced it conducted a full-power "hot fire" test of the upgraded first stage propulsion system of its Antares medium-class rocket using new RD-181 main engines. The 30-second test took place at 5:30 p.m. (EDT) on May 31, 2016 at Virginia Space s Mid-Atlantic Regional Spaceport (MARS) Pad 0A. Initial indications are that the test was fully successful. The Antares engineering team will review test data over the next several days to confirm that all test parameters were met. Assuming the success of the test is confirmed, it will clear the way for the resumption of Orbital ATK s cargo logistics missions to the International Space Station (ISS) from Wallops Island, Virginia, currently scheduled for July. Early indications show the upgraded propulsion system, core stage and launch complex all worked together as planned, said Mike Pinkston, Orbital ATK General Manager and Vice President, Antares Program. Congratulations to the combined NASA, Orbital ATK and Virginia Space team on what appears to be a successful test. During the test, a number of operational milestones were met including full propellant loading sequence, launch countdown and engine ignition and shut down commands, as well as multiple throttle settings including full engine power. The test also validated the launch pad s operation, including propellant tanking and the use of the water deluge system to protect the pad from damage and for noise suppression. Each of the new flight RD-181 engines has undergone hot fire acceptance testing at the manufacturer s facility prior to being shipped to Orbital ATK. A certification test series was successfully completed in the spring of 2015 where a single engine was test fired seven times, accumulating 1,650 seconds of test time and replicating the Antares flight profile, before being disassembled for inspection. The successful stage test, along with the extensive testing of each new RD-181, gives us further confidence in the first stage propulsion and in moving forward to launch, said Pinkston. We are now focused on the OA-5 mission and launching the enhanced Cygnus spacecraft to the International Space Station on our upgraded, higher-performing Antares rocket. The enhanced Cygnus recently flew on the successful OA-4 and OA-6 missions, launched in December and March, respectively. The spacecraft has several new features, including larger cargo capacity, the use of Orbital ATK s lightweight UltraFlexTM solar arrays, a mass optimized service module structure and a lighter weight propulsion system. Cygnus, like most Orbital ATK spacecraft, is compatible with multiple launch vehicles, enabling the recent use of United Launch Alliance s Atlas V launch vehicle. The OA-5 mission will be the first Antares mission to launch the enhanced Cygnus.